Springtime is crappie time. There's no doubt about it. In many parts of the country the period we're in right now will produce some of the best fishing for these great eating panfish you're likely to encounter all year. In my last column I talked about the importance of fishing in the right spots if you hope to catch crappie consistently. Let's assume you've used some of the tactics I detailed in last month's column to pin down some of their springtime holding spots. The next step is to fish those spots at exactly the right depth. 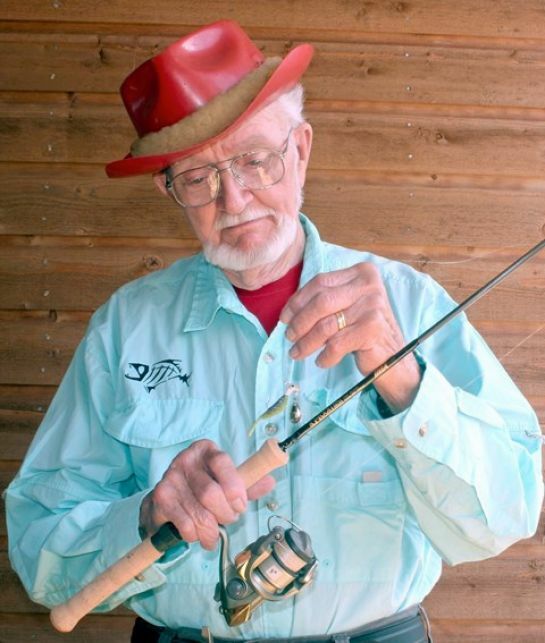 I had the importance of fishing at the right depth brought home in a hurry one morning long ago on while fishing the Columbia River backwaters for crappie. These sloughs are often home to both bass and a variety of panfish. I had been bass fishing one beautiful spring morning. The bass weren't cooperating. I had always done well for crappie in the part of the slough I was on. I decided I'd fished bass long enough and would look for crappie instead. The problem was I hadn't brought my usual crappie gear along. When I'm serious about crappie fishing I carry a separate tackle box for that purpose. It's loaded with the smaller jigs and tiny worms that crappie can't resist. That little Road Runner lure you see here is a super tool for locating crappie schools in the spring. Get the smaller sizes so you can get the desired depth with a slow retrieve. As I said, I didn't have any of these things along. I scrounged around in my tackle box and finally found a couple of little spinner flies. I cut a piece of bass sized pork rind down to a couple of inches and hung it behind the fly. I also took a little ¼ ounce Bead Chain sinker and hung it ahead of the spinner. The combination just barely gave me a lure heavy enough to throw with the casting outfit I'd been using for bass. 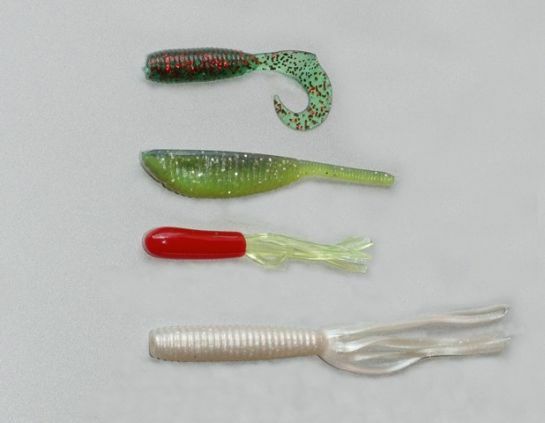 Any one of these lures used along with a tiny leadhead can be dynamite for crappies. I fished that little spinner and rind in the spots where I usually caught fish when I had my crappie tackle along. I couldn't buy a bite. Finally, tired and disgusted, I tried to throw that lightweight rig farther than I should have. The result was a backlash that would have made a preacher cuss. I sat there picking at my miserable tangle of monofilament line for five minutes. In the meantime my little spinner fly sank to the bottom in water that was at least 25 feet deep. I finally got the twisted line untangled and started reeling in. I moved my spinner-fly about three feet out of that deep water when the line tightened. Snag, I thought. Wrong! That snag turned out to be a beautiful crappie. I sat right there in the same spot that morning and wound up catching 20 of the nicest crappie I ever took from the slough I was on. Why hadn't I caught fish earlier? It was simply because I hadn't been fishing deep enough. The fish weren't up in the shallows where I'd expected to find them. They were much farther out. That backlash turned out to be a blessing. Once I finally blundered into fishing the right depth, I started catching fish. I've had similar experiences time and again in crappie fishing. In the spring you'll often find crappie in tight clusters and at the same depth. I don't know how many times I've taken beautiful catches from around downed logs. Drop a jig or perhaps a little marabou fly on one side of such logs and nothing happens. Let it down to exactly the right depth on the other side and it's a fish every cast. You simply can't be too alert when you are after crappie. Try to remember what you were doing and the depth at which you were fishing when one comes along. Get your lure back into the exact spot where the first one appeared. I repeat---in the spring crappie will often be in tight clusters and feeding at exactly the same depth. They might come up to grab a lure, but they will have followed it up from the depth where they first saw it and where all of them are holding. A word of caution: If you find crappie holed up in the branches of a downed tree, and that's a common situation, try to avoid tugging and pulling on the branches if you hang up. Sure as you do you'll spook the fish. When that happens you may as well move to a new spot. Use light line, a line that will break with a strong steady pull. That's far better than jerking the cover around and scaring the hell out of the fish holding there. Even after you've found crappie and established the depth at which they are holding, there's a third and final key to putting them into your boat consistently. It's using the proper lure speed. We'll take a close look at that aspect of crappie catching in next month's column. You'll find it right here beginning June 1. 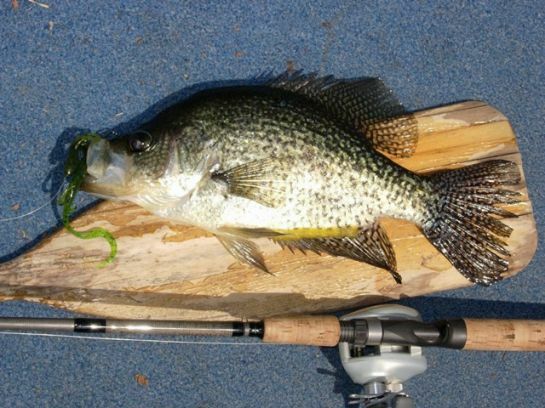 My friend Bruce Holt, of G.Loomis Rods, caught the dandy crappie pictured here. Few fish do more for a frying pan that a fresh caught crappie.